I started this project back in the beginning of 2014 as the Raspberry Pi Repeater Controller Project but that quickly evolved into the Open Repeater Project. It's the same project but as some things change like working on making the project open source, building a community around the project, and expanding out to other embedded Linux boards, a name change was a no brainier. I started this project as a small proof of concept idea but as I worked on it, it's potential started to become more evident. In the beginning I spend some time deciding if I wanted to take a commercial route with the project or make it open source. GREAT NEWS FOR HAMS...the project is Open Source! In setting out to develop this project my primary goals and features are to develop a low cost, low power, but feature rich duplex repeater controller suitable for setting up a temporary / emergency repeater systems with radios that can be run on portable power. However with a more complete feature set and a modular design, it could also be used as a primary or a backup controller for a permeant installation repeater. With the low cost, modular design, it would make it easy to keep backup hardware on site for easy service swap-outs. The additional circuitry required to interface a SBC to the radios would ideally mount on a “cape” or “daughterboard” style circuit board that would mount on top of the SBC by plugging into the GPIO connector. This repeater setup is initially intended for use on Amateur Radio, but could be potentially useful on other radio services such GMRS, Commercial, etc. 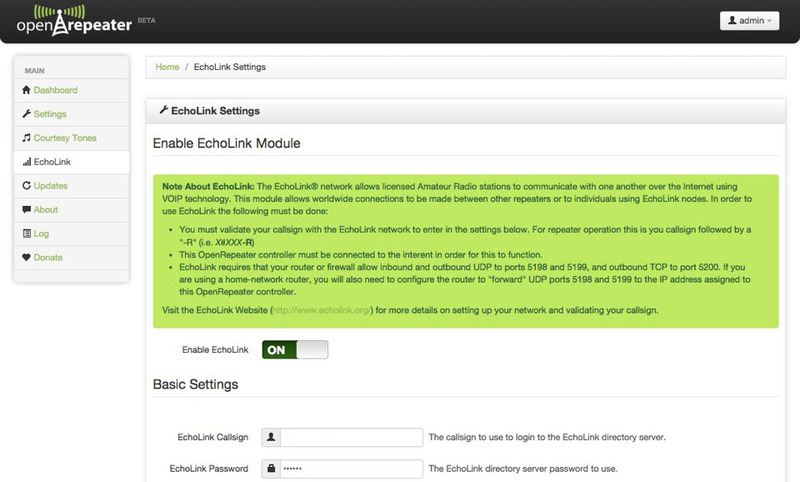 Web server Interface for controlling settings - Will be provided by built in ethernet jack. OPTIONAL - Real Time Clock to maintain time if not connected to the internet. This would be useful for time announcements and logging/statistics.